Create more wins in your work and life in 30 days! Inspired Action will jumpstart your business in 30 days! If you feel busy, but unproductive, it's time to get out of your own way and start creating more wins in your business and life. 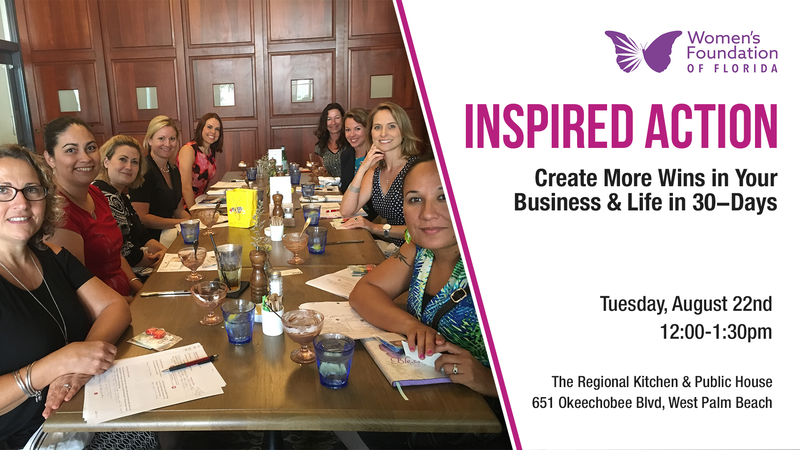 Join Women's Foundation Board Member Kate Volman for this small group working lunch. You'll leave with a custom plan to finally execute on the important activities you keep moving down your to-do list. Kate Volman shares resources to inspire owners to take action and create more wins in their business. She is a host, content marketing strategist, and video content creator. Her love of entrepreneurship started over fifteen years ago while working at the Boca Raton Chamber of Commerce. During her tenure there, she created programs, workshops and initiatives to help small business owners build better relationships and execute results-driven marketing strategies. She also spent two years as the Marketing Director for the City of West Palm Beach Community Redevelopment Agency. During her time there, she launched a video marketing strategy which included a unique community focused show called West Palm Inspired to help shine a spotlight on local businesses! She is currently the co-host of three weekly live streaming shows and creates videos weekly for her YouTube channel! She is also an Entrepreneur.com Network Partner and video contributor for GoDaddy's online publication, The Garage.